The UPA government today released details of the consultation process held with the state governments on the issue of FDI in retail to blunt criticism from the Opposition that the government did not honour its commitment to forge a consensus on the issue. The latest entrant on Indian political scene, Arvind Kejriwal’s Aam Aadmi Party (AAP) was formally launched today in the presence of thousands of supporters amid voluntary donations and offers of premises for party offices by newly-inducted members. A Prime Minister's Office (PMO) official today identified in a Delhi court the letters exchanged between former Telecom Minister A Raja and Prime Minister Manmohan Singh in November-December 2007 on the issue of 2G spectrum allocation. The Indian judicial system continues to reel under massive vacancies leading to delay in justice delivery and mounting case load. As many as 281 sanctioned posts of high court judges are lying vacant across the country, amounting to a whopping one third of the total sanctioned strength. Amid protests by the entire Opposition, the ruling Samajwadi Party (SP) somehow pushed through its first supplementary Budget of Rs 5,861.29 crore in the Vidhan Sabha today. The House was then adjourned for the day. With more tribal communities in Assam raising demand for autonomy under the Sixth Schedule of the Constitution, the anti-talks (hawks) faction of the United Liberation Front of Asom (ULFA) led by its fugitive commander-in-chief Paresh Barua is apparently worried over the dwindling support among ethnic groups in the state. The Defence Ministry’s well-crafted plans, backed by a huge budgetary support, to construct roads alongside the Chinese frontier have not fructified for the second year running. The Uttarakhand BJP today suspended former Minorities Commission Chairman Sukhdev Singh Namdhari from the primary membership of the party. The step comes after his arrest in connection with the Chattarpur farmhouse shootout. Sukhdev Singh Namdhari, the alleged conspirator in Ponty Chadha and his brother Hardeep Singh’s murder case, owned three weapons for which he had procured arms licence from Kurali in 1995. The Supreme Court today asked the chief ministers of Tamil Nadu and Karnataka to meet and arrive at an amicable solution to the "sensitive" Cauvery water dispute. New Delhi, November 26 The Supreme Court today stayed attachment proceedings of the properties of fugitive underworld don Dawood Ibrahim's mother and sister in Mumbai. A unique collaborative initiative by the Council for Scientific and Industrial Research (CSIR) to develop low-cost drugs for infectious diseases is all set to taste its first success. Over 600 persons comprising jurists, academicians, campaign and movement leaders, social activists and community members came together at Mavlankar Hall in the capital today to express concern over the non-fulfilment of basic Constitutional guarantees and to take a pledge to realise these rights. Lankan child in Cong’s Gujarat election ad? Congress’ Gujarat unit was at the centre of a row today over a picture it used for a poll advertisement on malnutrition in the state amid allegations it was ‘lifted’ from a website of a Christian organisation depicting a Sri Lankan child. With Parliament stalled for several days now and the Opposition insisting on a vote on the issue, the government released details of correspondence, meetings and discussions held by the Commerce and Industry Ministry with the states. According to responses received from the states to letters written by the ministry seeking support for the policy, 11 out of 21 states and union territories have supported the policy, three states are ambivalent and seven states have opposed. The government pointed out that the chief secretaries of Himachal Pradesh and Gujarat, both BJP ruled states, have only raised certain queries on the essence of the policy without rejecting it. Official sources said a broad consensus emerged among all stakeholders supporting the introduction of FDI in retail with appropriate safeguards which were built into the revised policy. Sharma wrote letters seeking support for the policy over the last one year to several chief ministers, including Parkash Singh Badal, Vijay Bahuguna, J Jayalalithaa, Akhilesh Yadav, Kiran Kumar Reddy, Naveen Patnaik, Nitish Kumar and Mamata Banerjee. In addition, he reached out to BJP leaders Sushma Swaraj and Arun Jaitley and Left leaders AB Bardhan, D Raja and Sitaram Yechury. Apart from the correspondence, Sharma held meetings and discussions with several chief ministers between November last year and August this year. The Industry Secretary had written to the chief secretaries of all the state governments in June, highlighting the benefits of FDI in retail and seeking their support for the policy. Kejriwal was accorded traditional felicitations by supporters from across India, a siropa and kirpan from Punjab, a Jaapi (traditional Assamese headgear) and a folk dance from Karnataka at the first public rally at the Sansad Marg here. The venue with an impressive turnout of people from all walks of life reverberated with slogans of “Bharat Mata ki Jai” and fluttering Tricolours. Kejriwal declared the party “result of struggle against corruption”. He administered four oaths to his supporters -- I will never give or take bribe; I will never sell my vote for a liquor bottle, money or saree; I will exercise my franchise in every election and I will not vote according to my caste or religion. As speaker after speaker forwarded support to the newly found party, Kejriwal’s colleague Kumar Vishwas kept the rally alive with references to corporate connections and Swiss bank accounts of other parties vis-à-vis AAP’s dependence of public support. Allegations were also made by some AAP members of the government’s “gag orders” on media against the coverage of the rally. Kejriwal, Pankaj Gupta and Krishna Kanth were appointed as the national convener, the national secretary and the national treasurer of the AAP, respectively. The constitution of the new party was released by former Law Minister Shanti Bhushan, while Manish Sisodia declared the name of the party and announced the names of the other 23 members of the national executive body, which includes Sisodia along with Prashant Bhushan, Dinesh Waghela, Sanjay Singh, Gopal Rai and Vishwas. Kejriwal said he would tour the country for the next year to "expose" the Congress and the BJP while trying to convince people why they should support his outfit. Deposing in the court as a CBI witness, Pushpendra Kumar Sharma, a section officer in the PMO, identified the letters written by Raja to the PM on November 2, 2007 and December 26, 2007. He told Special CBI Judge OP Saini that he had sent a letter to the CBI on March 9, 2011, through which he had sent the correspondence mentioned therein to the agency on its prayer. At present 614 judges are working against a sanctioned strength of 894 in high courts across the country, the government told the Parliament today. In other words, almost one-third of the total sanctioned strength of judges is lying vacant. The maximum number of vacancies is in Allahabad High Court (73) followed by Punjab and Haryana High Court (26) and Bombay High Court (20), according to the data furnished by Law and Justice Minister Ashwani Kumar in response to a written question. The Allahabad High Court is working with 87 judges against the approved strength of 160 judges while the Punjab and Haryana High Court is functioning with 42 judges as against the sanctioned strength of 68 judges, the minister said in response to the query by nominated member HK Dua. There are 17 vacancies each in Rajasthan, Andhra Pradesh and Chhattisgarh high courts. The only high court to be working with complete strength is Himachal with an approved as well as working strength of 11 judges. According to the Law Minister, the initiation of proposal for appointment of a judge of a high court rests with the Chief Justice of that high court. “Filling of the vacancies in the high courts is a continuous consultative process among constitutional authorities to select suitable candidates. It is a time-consuming process as it requires consultation and approval from various constitutional authorities. While every effort is made to fill the existing vacancies expeditiously, vacancies keep on arising on account of retirement, resignation or elevation of judges,” he said. Kumar said every effort was made by the Centre to fill the vacancies, including through periodically reminding the Chief Justices of the high courts to initiate proposals in time for filling the existing vacancies of judges as well as the vacancies anticipated in next six months in the high courts. The first proper working day of the winter session of the Vidhan Sabha started with the Opposition parties coming together to disrupt proceedings in both Houses of the state legislature on the issue of deteriorating law and order situation and delay in the announcement of cane support price. In the Upper House, the BSP forced adjournments. Its leader Naseemuddin Siddiqui demanded dismissal of the state government and imposition of the President’s Rule in the state. 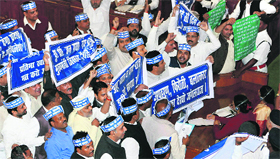 In the Vidhan Sabha, BSP members waved blue banners carrying slogans like “UP bana danga pradesh, mukhya mantri jiska Akhilesh”, “250 din ka SP ka kushasan, yaad aaya BSP ka sushasan” and “Chhalava samajwad ka, badhava aatankwad ka”. Rashtriya Lok Dal members carried green placards carrying slogans against the state government. BJP members waved orange-coloured banners. Some BJP members wore long capes with photographs of sugarcane painted on them. As soon as the House proceedings began at 11 am, BSP and RLD members barged into the well, raising anti-government slogans. They forced a series of adjournments, leading to the suspension of question hour. Later, Chief Minister Akhilesh Yadav, who also holds the finance portfolio, tabled the first supplementary Budget to the tune of Rs 5,861.29 crore. When the House re-assembled, the Opposition continued to create noise and did not heed to Speaker Mata Prasad Pandey’s pleas to restore order in the House. The day’s business was rushed through and the House was abruptly adjourned thereafter. Protesting against the manner in which the House was adjourned, BJP members squatted in the well of the House. They sought extension of the four-day session and immediate announcement of sugarcane support price. Senior BJP leader and MLA from Charkhari in Bundelkhand Uma Bharti on Monday made a brief appearance in the Vidhan Sabha, almost eight months after being elected. Accompanied by senior BJP leader and MLA from Lucknow (East) Kalraj Misra, Uma Bharti entered the House during an adjournment and walked straight to Chief Minister Akhilesh Yadav. They then held a meeting in the CM’s office on the same floor. Uma did not stay in the House for much long thereafter and sneaked out as the Opposition was protesting against the poor law and order situation in the state. The ethnic groups take the ULFA as an organisation representing the Assamese-speaking population but not exclusively the tribal communities. The tribal communities have been demanding autonomy and have shown least interest in ULFA’s ‘armed revolution’ aimed at ‘liberating’ Assam. In order to regain the support base among various tribal communities, the ULFA (anti-talks faction) has called upon all the indigenous ethnic groups in Assam, including Bodo, Karbi and Dimasa, to join its armed revolution to liberate Assam from the clutches of the ‘colonial Indian state’. The self-styled ‘chairman’ of the outfit Abhijit Asom in a statement issued here said once Assam could be ‘liberated’, the issue of protection of individual identity, political and economic rights of all the indigenous ethnic communities could be talked out. The ULFA said it would aspire for unity among diversity. “It is not possible within the framework of Indian Constitution to fulfil the political aspirations of individual ethnic communities in Assam. The autonomy granted under the Sixth Schedule of Indian Constitution to various ethnic groups in the state has failed to fulfil the aspiration of tribes as a whole, while a handful of leaders of those communities have reaped the benefits. The autonomy is designed to create division among various ethnic groups so that the aspiration for a unified greater Assam remains unfulfilled,” the ULFA statement alleged. The ULFA pointed out that growing tendency among various indigenous communities in Assam to identify themselves only by their tribal identity instead of as ‘Assamese’ (resident of Assam) because of ‘illusion’ over the ‘dominance’ of Assamese-speaking non-tribal communities had served very fruitfully to the ‘design of colonial Indian state’ to keep Assam a divided house. A security source termed ULFA’s comment an apparent attempt to woo back tribal communities whose support towards it revolution has been on the wane. Without the support of ethnic communities, it would be difficult for the outfit to regain its base among the people. With various principal tribal communities in the state aspiring for autonomy, youths of these communities have lost interest in the revolution led by the ULFA to ‘liberate’ Assam. The Border Roads Organisation (BRO) was tasked to lay these roads. However, the organisation has not been able to make sufficient progress due to a clutch of reasons. Till the end of the first half of the ongoing financial year, the BRO had spent around Rs 1,833 crore, which is just about 36 per cent of the allocated budget of Rs 5,100 crore. The figures are based on the data accessed by The Tribune till September 20, the first half of the 2012-13 fiscal ended 10 days later on September 30. Unlike other departments that catch up on budget utilisation in the second half of the fiscal, the BRO cannot build roads in the Himalayas after October as severe winter has already set in, thus making road work impossible. The situation was the same last fiscal when the BRO struggled to use its allocated budget of Rs 4,962 crore. As a result, the work on all roads bordering China is running behind schedule. All these roads are of strategic importance. The Army is paying out of its own budget for some and others had been recommended by the all-powerful China Study Group (CSG) headed by the Cabinet Secretary. The slackness in road construction is evident despite PM Manmohan Singh and Defence Minister AK Antony’s assurances that the work to build infrastructure alongside the Chinese frontier is progressing well. Antony was apprised about the tardy pace of work last week. He later asked the BRO to come up with reasons for the delay. Of the 61 roads monitored, work was found to be satisfactory only on 13. 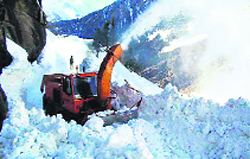 Key roads in Arunachal Pradesh, Jammu and Kashmir, Himachal, Sikkim and Uttarakhand are running behind schedule. In contrast, China is double-laning major highways in Tibet. The key is the road to connect Lhasa with Aksai Chin, part of Jammu and Kashmir that was forcefully occupied by China in 1962. This 3,105-km road has three alignments that branch out into various unreachable areas of the Tibetan Plateau. It runs all along the Sino-India border. China has already constructed roads connecting all its highways to logistic centres and major defence installations that dot the border with India and the Line of Actual Control (LAC) in south eastern J&K. Some of these roads come as close as 1 km of the LAC. Antony has asked his officials to re-examine the report on BRO submitted by Lt Gen SS Sengupta, Commandant of the Pune-based College of Military Engineering. Of late, Namdhari had started becoming liability for the BJP and today state party chief BS Chuphal issued his expulsion letter. “After becoming the Chairman of the minorities commission, he ceased to be a member of the party, but today he was officially expelled from the primary membership of the party,” Chuphal said. The BJP’s ambivalence on the issue was, however, quite evident in the delay. The voices for his removal had been getting shriller in the party as more and more details about his alleged complicity in the murder of the Chadha brothers emerged. BJP’s Gadarpur legislator Arvind Pandey even wrote a letter urging the party to take action against Namdhari. “He actively campaigned against me though he had been my private security guard in 2002. I could never trust him. Namdhari was brought to the BJP fold by senior BJP leader Bhagat Singh Koshiyari, who was even keen to give him the Assembly ticket from Gadarpur in the 2012 elections. To accommodate him, my name was withheld and announced a little late,” said Arvind Pandey. He alleged businessman Ponty Chadha had invested in benami properties through Namdhari and his family members. BJP leaders maintain Namdhari has been in the habit of shifting loyalties too often. “He began his career as a private security guard of Akali Dal leader Harbhajan Singh Cheema. He also remained a security guard to Gurjeet Singh Rana, political leader from Punjab who has interest in Udham Singh Nagar. He later came in contact with liquor baron Ponty Chadha and Arvind Pandey,” said a BJP leader from Udham Singh Nagar. This fact came up in the preliminary reports of the inquiry that has been initiated by SP (Headquarters) Darshan Singh Mann following the directions of Mohali SSP Gurpreet Singh Bhullar here today. The police added that the licence had been issued in the name of Sukhdev Singh Namdhari s/o Roor Singh, r/o Master Colony, Kurali, and the three licenced weapons were 12 bore pistol, 315 bore rifle and 7.62 mouser. The licence (276/Kurali/DM/Ropar) was issued on March 2, 1995, when the area was under Ropar district. The permission for the 315 bore rifle was given the next day. Permissions for the 12 bore rifle and 7.62 mouser were given on September 21, 1995, and December 15, 2008, respectively. The licence was renewed on March 30, 2010 will expire on March 1 next year. "Why the two Chief Ministers can't sit together? Give it a try, it is not impossible," a bench of justices D K Jain and Madan B Lokur said. "We want you to meet in a congenial manner and discuss the issue in the larger interest of farmers from both states," it said. The court said that it is not possible for Cauvery River Authority (CRA) headed by the Prime Minister to meet, so the state governments should meet to find a solution. "Try to find out a solution through give and take," the bench said, adding that "the chief ministers should not meet just for coffee but they should meet along with their experts to file a solution". Senior advocate Fali S Nariman, appearing for Karnataka, said there is no problem in meeting and the Karnataka Chief Minister will certainly meet. The Supreme Court today stayed attachment proceedings of the properties of fugitive underworld don Dawood Ibrahim's mother and sister in Mumbai. A bench of Justices TS Thakur and FMI Kalifulla also issued notice to the Centre on Dawood's mother Amina Bi (dead, petition filed by her legal representative) and sister Hasina Ibrahim Parker's plea challenging the attachment order of their residential houses. An anti-TB molecule, developed through CSIR’s Open Source Drug Discovery (OSDD) initiative, will enter the first phase of clinical trials in a few months. This marks a major milestone for the OSDD programme that links researchers across the globe to solve key challenges in designing drugs for tropical diseases like malaria and tuberculosis which fail to draw the attention of big pharmaceutical research companies. The project is based on a portal that provides an open source platform for scientists, doctors, technocrats, software professionals and students to share knowledge. The collaborative approach, started four years ago, is designed to keep the cost of drug discovery low, thereby making the treatment affordable. “Our target is to get into the first phase of the clinical trial of the anti-TB drug molecule in about six months,” CSIR Director-General Samir K Brahmachari said. He was talking to reporters after delivering the 25th Foundation Day lecture of the Centre for Cellular and Molecular Biology, a CSIR institute here. The 50 participating organisations and people’s movements have come together for what they are calling a people’s parliament (Jan Sansad). The gathering will deliberate important challenges in front of the nation and release a people’s manifesto ahead of the 2014 poll. The first day of the five-day congregation saw former Chief Justice of India Justice JS Verma (retd) leading the gathering in taking the pledge, reaffirming the strength of collectivism. The campaign is being attended by activists who have taken part in a range of struggles — from land rights, Dalit issues to child rights. Also present were National Minority Commission chief Wajahat Habib, National Advisory Council members Harsh Mander and Aruna Roy, activists Binayak Sen, Deep Narayan, Medha Patkar, Baba Adhav, jurists Justice Leela Seth and Soli Sorabjee, historian Romila Thapar, Prof Praveen Jha and Kamla Bhasin. Gujarat Congress party’s “Join hands for change” advertisements which appeared in some newspapers and posted on its website claims that 45 per cent of children in the state were malnourished. A photograph in the ad also showed a malnourished child in the arms of a woman. The social media, however, went abuzz with claims that the picture of the skinny and malnourished baby was, in fact, a victim of flood in Sri Lanka which was lifted from the website of a Christan organisation called Amyand Park Chaple (amyand.com) with one pro-BJP website even providing a ‘link’ to view the original picture. Finding itself in an awkward situation, the Congress in an effort to counter the BJP charge, alleged that the ruling party was deflecting the main issue of malnutrition. “The photograph is symbolic and rather than focussing on the picture, the BJP should counter the figures given in the advertisement,” said Siddharth Patel, in-charge of Gujarat state Congress' poll campaign while talking to newsmen.